This whitepaper explores how real-time information, greater visibility and control can strategically improve your manufacturing operations. Access to timely information has become paramount to success in the apparel and sewn products manufacturing business. In order to effectively manage, manufacturers require timely information about what is happening on the plant floor. In today’s fast-paced and competitive business environment, real-time information gives companies the tools needed to anticipate exceptions and run balanced, efficient facilities. The competitive edge to be gained from having access to timely information is driving a growing number of manufacturers to implement realtime shop floor control (SFC) systems in their factories. Until recently, most manufacturers relied on low-cost, batch data collection systems to monitor plant productivity. Such systems typically collected information on daily production for review at the end of each workday. Managers were limited by the fact that they could only react to the past rather than act on issues while there was still time to address them appropriately to improve productivity. The preferred, albeit more costly, alternative is real-time data collection because information on production is collected as it occurs and presented to management and teams on an ongoing basis. Quickly recognizing the return on investment (ROI), hard goods manufacturers readily adopted real-time data collection in the early 1970s. Soft goods manufacturers took longer to jump on the bandwagon. It wasn’t until the mid-1980s that the first wide scale adoption of realtime data collection occurred in sewn products. The first BlueCherry® Shop Floor Control (formerly Leadtec®) installations occurred in 1987. Since then, more than 150,000 terminals have been installed. With this new breed of affordable terminals and systems, apparel companies could now commonly achieve an ROI on SFC in a 12 to 18 month timeframe. 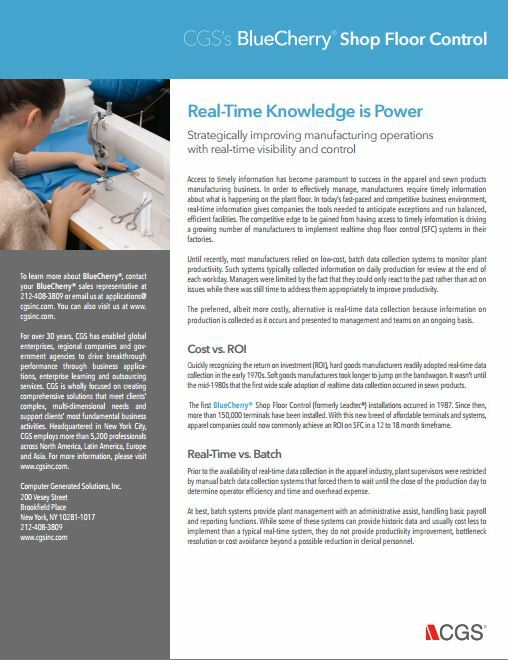 Prior to the availability of real-time data collection in the apparel industry, plant supervisors were restricted by manual batch data collection systems that forced them to wait until the close of the production day to determine operator efficiency and time and overhead expense. At best, batch systems provide plant management with an administrative assist, handling basic payroll and reporting functions. While some of these systems can provide historic data and usually cost less to implement than a typical real-time system, they do not provide productivity improvement, bottleneck resolution or cost avoidance beyond a possible reduction in clerical personnel. Check the box to receive industry reports, webinar invitations and product insights tailored to your interests from CGS.